Finance minister Matia Kasaija issued the directive. Courtesy photo. The Finance ministry has ordered all ministries, departments and agencies, which owe Uganda Telecom Ltd money to immediately clear the outstanding debts. Failure to do so, Keith Muhakanizi, the Permanent Secretary Ministry of Finance, said their quarter financial year allocation of 2017/18 shall be withheld until payment is made. 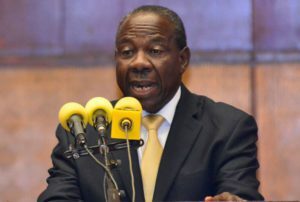 The resolution was made on Wednesday at the ministry’s head offices in a top management meeting chaired by Matia Kasaija, the Finance minister. The meeting was called to discuss the current status and performance of UTL. In a letter dated September14 and addressed to all accounting officers, the Finance ministry also ordered that all the mobile and fixed telephony communication on government business must be done through UTL. “All ministries, departments and agencies should procure internet services from UTL to lower the cost of sourcing internet to government,” the letter reads in part. The administration of UTL was requested to follow up on the implementation of the decisions and update Muhakanizi on the status within three weeks. This year, government repossessed UTL in an attempt to solve the financial crisis the telecommunication firm was facing. The move by the government to take over UTL was aimed at protecting the country’s interests and preserving hundreds of jobs. Uganda co-owns UTL with the Libyan government, which has 69% shares. Parliament had accused the UTL top officials of running down the firm, earning themselves huge bonuses and salaries. The officials were also accused of mistreating the employees. At one time, Cameo Techedge Limited, an Asian-owned private company, petitioned court to close UTL over a $133, 000 liability. PricewaterhouseCoopers, a UK-based audit firm placed the company’s debt as a humongous Shs700b.